Douglas MacArthur said ‘Old soldiers don’t die, they just fade away’, and he was right, but what he didn’t bank on, and couldn’t have known, is that sometimes, just sometimes, those old soldiers come back. Having both “died”, and slipped from mainstream memory, only to later cheat the Reaper out of his bounty, Steve Rogers and James Barnes (better known, for the benefit of those who came in late, as Captain America and Bucky) returned from the grave, one to public acclaim as he once more assumed the role of hero and the other to international condemnation as the prize puppet and master assassin of Cold War era Soviet Russia. And six decades after they last saw each other, their paths crossed again, this time as enemies and the mystery of the Winter Soldier began. While Cap’s history since his revival is well documented, Bucky’s is shrouded in secrecy and whispered rumour, and ‘The Bitter March’ is one of those hidden chapters, the one that tells the story of how the Winter Solder met The Iron Nail. 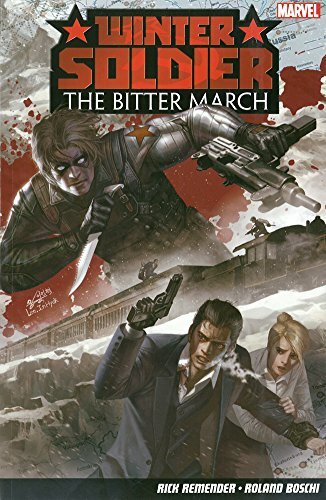 Set in 1966, ‘The Bitter March’ pits SHIELD (Nick Fury and Ran Shen) against the USSR and Hydra in a race to capture a pair of former Nazi operatives who hold the key to the transmutation of metals, and the balance of global power, in their hands. Well, actually it’s in their minds, as it’s a formula, and you know, they’ve commuted it to memory like all the best spies do. The stakes are high, and in an action packed, violent, no holds barred tale of death and destruction, all of the players gradually reveal their hands. This however, is a game that doesn’t have any winners, only survivors, and in the end, it’s all about who emerges from ‘The Bitter March’ in one broken, fractured piece. But in one piece nonetheless.